I’m not quite sure whether or not it is a good idea to give a 10 point rating to such a popular astronomy and space exploration classic as Carl Sagan’s “Pale Blue Dot”, but giving any other rating would mean there’s room for improvement. 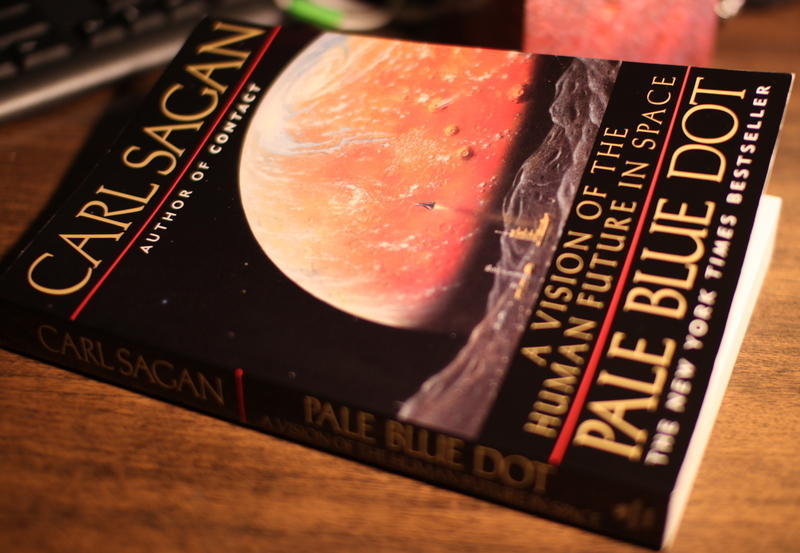 This book is the first astronomy book I’ve read by Sagan, as I’ve tried to rather read newly or recently released books to keep up with the new stuff, but “Pale Blue Dot” seemed to be calling my name on the bookstore shelf just a little bit too loudly to be ignored. It was originally published in 1994, but in most chapters you wouldn’t even notice it, although just the thought that it’ll be twenty years from when it was first published is a little scary. “Pale Blue Dot” is about how humans have discovered the planets and stars and the whole universe and realized that it’s a huge place we live in. It’s also about how scientists have discovered how hot is the surface of Mars and that the largest volcano in the Solar system is on Mars. The content here is rather varied and really exciting and interesting throughout going from history of astronomical discoveries to terraforming other bodies of the Solar system and searching for extraterrestrial life and dodging near-Earth asteroids.